Glasgow Film Festival 2018 will open on 21 February with the UK premiere of Wes Anderson’s Isle of Dogs. The latest film from the director of The Grand Budapest Hotel (which had its UK premiere at Glasgow Film Festival 2014) and Fantastic Mr Fox, the animated adventure Isle of Dogs tells the story of Atari Kobayashi, 12-year-old ward to corrupt Mayor Kobayashi. The all-star voice cast includes Bryan Cranston, Koyu Rankin, Edward Norton, Liev Schreiber, Bill Murray, Bob Balaban, Jeff Goldblum, Scarlett Johansson, Kunichi Nomura, Tilda Swinton, Ken Watanabe, Akira Ito, Greta Gerwig, Akira Takayama, Frances McDormand, F. Murray Abraham, Courtney B. Vance, Yojiro Noda, Fisher Stevens, Mari Natsuki, Nijiro Murakami, Yoko Ono, Harvey Keitel and Frank Wood. Fox Searchlight Pictures will release Isle of Dogs in UK cinemas on March 30, 2018. Tickets for the Opening Gala will go on sale at 10am on Monday 8th January at glasgowfilm.org/festival. The full programme for Glasgow Film Festival 2018 will be announced on Wednesday 24 January. Other events already confirmed include a focus on new Irish cinema in Ireland: The Near Shore; the Oscar-nominated composer Mica Levi performing live as part of The Unfilmables, a celebration of the greatest films never made; Scottish Album of the Year Award-winners Sacred Paws with a pulsating live soundtrack to Margaret Salmon's full-throttle speedway doc Mm and the return of the festival's hugely popular special events screenings, from a night of The Big Lebowski and bowling to a Gregory's Girl v Clueless school disco. 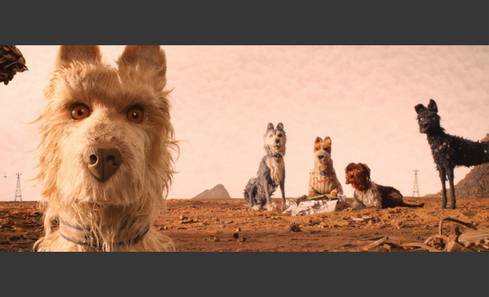 Isle of Dogs (UK Premiere): Wednesday 21 February 7PM, GFT Glasgow, £15 / £13 conc. Tickets on sale from 10am Monday 8th January. Ticket includes entry to the GFF opening party after the screening. The fourteenth annual Glasgow Film Festival will run from 21 February – 4 March 2018. The full programme will be launched on the evening of 24 January, with tickets on sale to GFF members and GFT CineCard holders from 12noon on 25 January and then on general sale from 10am on 29 January. GFF Membership is available to buy now for only £10, offering four days of advance booking, and discounts. See www.glasgowfilm.org/gffmembership for full information. Existing GFT CineCard members will automatically have GFF membership. Notable guests visiting the festival in recent years have included Richard Gere, Alan Rickman, Joss Whedon, Terry Gilliam, John C Reilly, Saoirse Ronan, Richard Dreyfuss, Jonathan Glazer, Richard Johnson, Gemma Arterton, Ben Wheatley, David Tennant, Cliff Curtis, David Robert Mitchell, Carol Morley, Gemma Jones, Jason Priestley, Neil Jordan, agnés b., Armando Iannucci, Jack O’Connell, Dexter Fletcher, Peter Mullan, George Sluizier, Peter Capaldi, Ty West, Richard Ayoade, Eli Roth and Jean-Pierre Jeunet. The 2017 festival featured the red carpet world premiere of David Tennant’s Mad To Be Normal and logged over 41,000 admissions, cementing its reputation as one of Europe’s major film festivals.